Andrew Caldecott’s Rotherweird was one of the most English and original fantasy novels of 2017. It focussed on the eponymous town hidden away from the rest of England and guardian of a secret door to another dimension called The Lost Acre. Rotherweird was full of Dickensian characters engaged in an ancient struggle but also had Monty Pythonesque flourishes. The epilogue to the action in Rotherweird indicated that more was going on than the protagonists suspected and this second volume is clear that all of the frenetic activity in that book was just “the end of the beginning” and so to Wyntertide. Wyntertide has a similar structure to Rotherweird. Historical vignette’s establish the backstory of a number of long lived characters still either making mischief or trying to prevent it. In the meantime the townsfolk are gearing up for a major event, in this case the mayoral election, which is being manipulated for nefarious purposes. Caldecott ranges across a kaleidoscope of characters as various factions manoeuvre and a centuries old plan fall into place. Rotherweird anchored its sprawling narrative around an outsider – Josiah Oblong, the new history teacher – who was also the reader’s proxy into this strange world. It allowed Caldecott the room to explore, explain and exposit. Wyntertide has no such crutch. It throws readers straight into some new historical detail and then into the world of the multitude of characters that inhabit Rotherweird. As a result, even for those familiar with the first book it will take some time to re-engage with the sprawling cast. 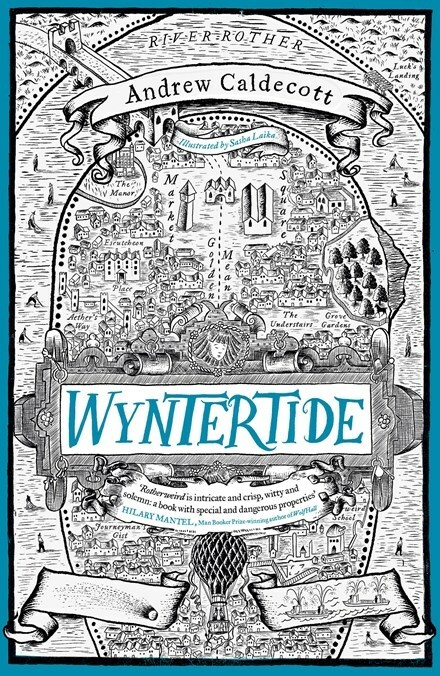 Wyntertide has all of the hallmarks of its predecessor both good and bad – quirky characters, puzzles, gothic flourishes and increasingly strange public events. While there is plenty of build-up, as the middle book of a trilogy, the book’s climax becomes little more than setup for the final volume. But it is a setup that will have readers hanging out for the last volume what is still enjoyable and highly original fantasy. This review first appeared in Aurealis #111, Australian Science Fiction and Fantasy Magazine, www.aurealis.com.au.